Many Californians were forced to evacuate their homes as wildfires ripped through the state. One family fleeing the flames uttered a five-word prayer as they drove straight into what appeared to be a wall of hellish fire destroying their hometown. Video footage captured the miracle that came next. 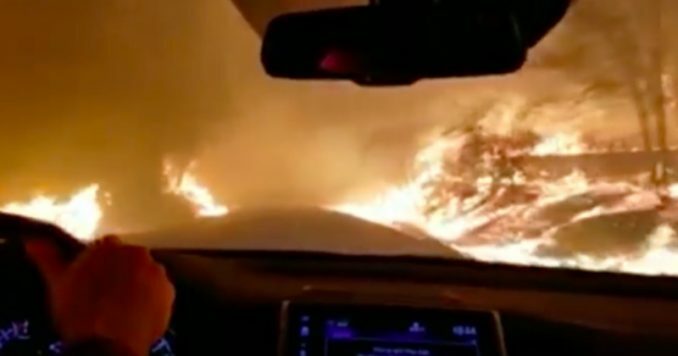 According to The Daily Caller, as fires rage on in California, jarring footage was captured of a woman and her family praying as they drove through the blaze, hoping to come out alive. Chatfield — who was forced to evacuate her hometown of Paradise, California — posted the video on Facebook, where it has since gone viral. Thankfully, she and her family did make it out alive, writing on social media that they are currently safe. “I feel very vulnerable posting this but I feel I should. My hometown of Paradise is on fire. My family is evacuated and safe. Not all my friends are safe. It’s very surreal. Things always work out, but the unknown is a little scary,” Chatfield wrote. The Camp Fire has wrecked the town of Paradise, located approximately 180 miles northeast of San Francisco. It is California’s most destructive fire on record, in terms of destroyed property. The Camp Fire, along with the Woolsey Fire in Los Angeles and Ventura Counties, have burned down 6,713 structures and killed at least 23 people. Unfortunately, there is no indication that the fires will subside anytime soon. The Camp Fire is listed as 25 percent contained, and the Woolsey fire is listed as only 10 percent contained. Meanwhile, the death toll is expected to rise, as there are another 110 people presumed to be missing in fire-devastated areas. The rise in California wildfires comes as President Donald Trump warned state leaders that he may withhold federal funds if they do not reform the state’s forest management. “With proper Forest Management, we can stop the devastation constantly going on in California. Get Smart!” the president wrote in a tweet Sunday morning on his return trip from Europe. We must all continue to pray for those affected by these devastating fires. There is no doubt as to the overwhelming power of prayer in a situation such as this one. The video above serves as proof.